Return to your open GMail tab and go into your email “Settings” (located in the drop down menu, when you click on the cog icon at the top right of the page). Hit the “Save Changes” button at bottom of the screen. Certain FCS departments will have additional information they need to include in the email signature (School address, fax number, email address, etc. ), and we ask that they format the text as requested above. The signature will not be included using the native mail app on the ipad (the standard “sent from my ipad” text). For the signature to appear when sending email from your iPad, you must use the GMail app that is downloaded from the App Store. Then in the Gmail App settings, you must turn off “Mobile signature”. Optional: If you have an active Twitter / G+ account associated with FCS, please follow the instructions below to add images and links to those sites. Please make sure that you include a line space between these icons and the Mission and Vision image. Use Ctrl+V to paste in the link you just copied. A new Gmail update will let you view and save attachments directly to Google Drive from within your message. Google announced the news on its official blog. The new feature is twofold. First, attachments are now visible as previews at the bottom of a message. That means instead of just seeing a list of files with the option to click “preview” (which opens in a separate browser tab), you see a preview within the message itself. 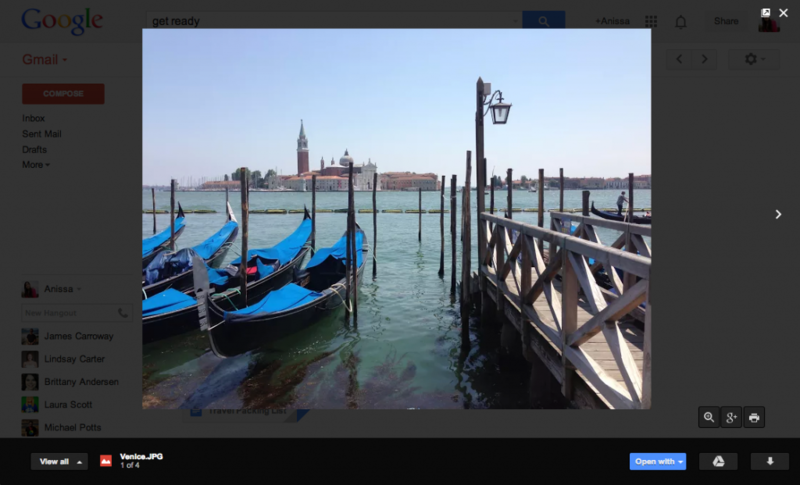 Clicking on the preview brings up a fullscreen view of the file, and you can navigate through several attachments the same way you flip through a photo slideshow. The more significant feature, however, is the ability to save an attachment directly to Google Drive. Simply click on the Google Drive icon that appears when you hover over an attachment and choose where to send your attachment. 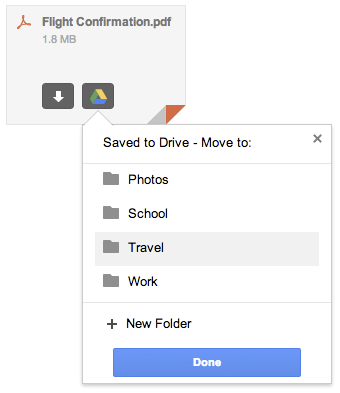 You can still download files directly to your computer —just click the arrow button, but the improved Google Drive integration allows for better file access across multiple devices. Google says that the new feature will roll out over the next week. In Veracross, you have the option to Email Parents or Email Students, which can be helpful when sending information to an entire class! You can find this feature in your class list, under the class name. 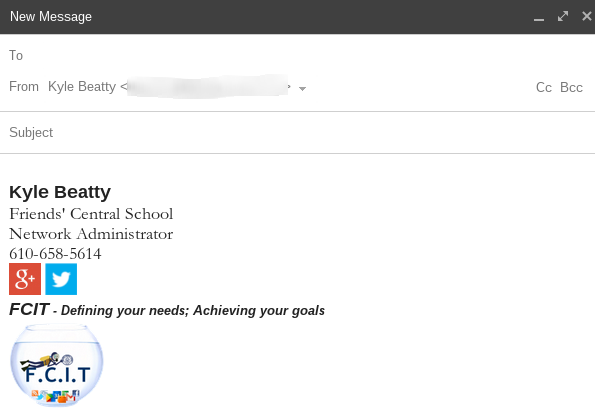 Scroll over to Contact, and you will see the option to Email Parents and Email Students. Ideally, clicking one of those options will populate a new compose email from your FCS account in the Chrome browser, when you are signed in. If this isn’t happening, and something like Outlook or another program is opening, we have a simple solution for you! When in Chrome, open your FCS email. Look for the a diamond icon on the right hand side of the address bar. Click the icon, select “Use Gmail”, and then hit Done. Our’s may say “Use Friendscentral.org to open all email links”, so definitely click that! 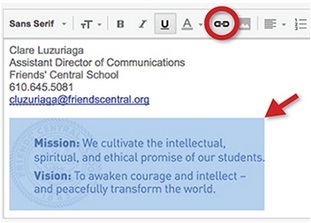 Selecting an email address will now open all new composing emails in your FCS gmail account. We all love to share good news with everyone in our community, but sometimes, the reply emails from many people in everyone’s inboxes creates more noise than is necessary. There is a way to control the reply emails that are generated when you use a group email address to send out a message. You can use the Bcc, or Blind carbon copy (in some places it is called blind courtesy copy) option when sending emails to a large email group. This allows the only the sender of a message to receive all replies to the original email message. This post isn’t to keep you from sending emails throughout the community, it is to make you more mindful of what you are sending and what impact reply-all emails can have on someone else’s inbox. In addition to email, be aware that we have a Google+ Community that is a good place to share information. 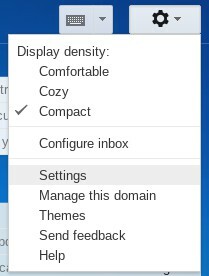 When you begin to compose an email to an email group, the Bcc option will show up on the right side of the compose box. Chose that link and and a new box will appear where you type in the email addresses you are sending the message to. 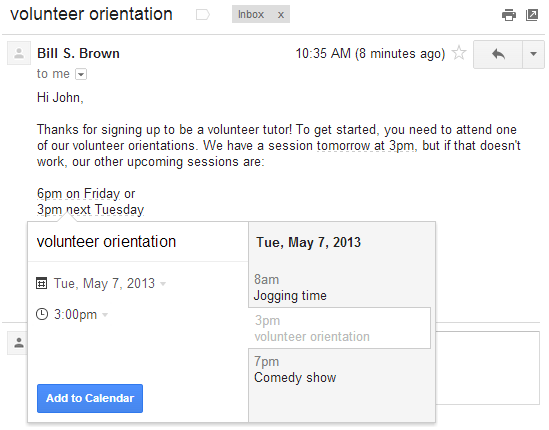 If you do a lot of scheduling over email, it’s now a little bit easier to create events directly from your Gmail. Starting today, dates and times within emails are lightly underlined: click them to schedule that conference call or lunch date without ever leaving Gmail. If you do a lot of scheduling over email, it’s now a little bit easier to create events directly from your Gmail. Starting today, dates and times within emails are lightly underlined: click them to schedule that conference call or lunch date without ever leaving Gmail. When you click on one of these underlined dates, you’ll be able to preview your schedule for the day and change the title, date or time of the event. Clicking “Add to Calendar” will do exactly that — add the event to your calendar, and for extra convenience, the calendar event will include a link back to the original email. If you make a typo or regret sending a message, you can undo the action by enabling the “Undo send” option. This gives you the option to take back a message you just sent for up to 30 seconds. Turn on Undo Send by clicking Settings, and you’ll see a new “Undo” link on every sent mail confirmation. Click “Undo,” and Gmail grab the message before it’s sent and take you right back to compose. With Gmail open, click the gear icon in the top right and then select Settings. Scroll until you find Undo Send. Check the box next to Enable Undo Send and select a cancellation period from 5-30 seconds. Be sure to save- scroll to the bottom and click Save Changes.